Students - Snipping paper snowflakes is one of the simple pleasures of life! If you live in a snowy place, it is a way to bring snow inside. If you live in a place with no snow, it is an easy way to create some. 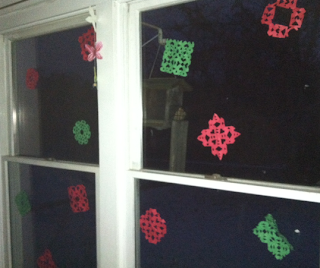 Last week, when my daughter Hope was sick, she cut lots and lots of snowflakes out of red, green, and white paper. You can see some of them above, in our living room windows. ...and then I began poem-ing! One thing that helped me write today was something I did last night. Before bed, I read aloud many many poems from J. Patrick Lewis's new IF YOU WERE A CHOCOLATE MUSTACHE. Falling asleep with the rhythms of our Children's Poet Laureate in my head was a wonderful thing to do, and it is something I highly recommend. Read ALOUD the work you admire, and those rhythms will sink into you. If you have ever wondered about snowflakes all being different from each other, visit Wonderopolis to read all about the chances of that happening. To learn about how to make paper snowflakes, visit Martha Stewart or High Hopes. Over at Design Sponge, you can read a great tutorial about making doily snowflake garlands. And at Spoonful, you can find a recipe for sweet tortilla snowflakes. We will make these today! There may be no snow in Holland, NY right now...but we can make our own! 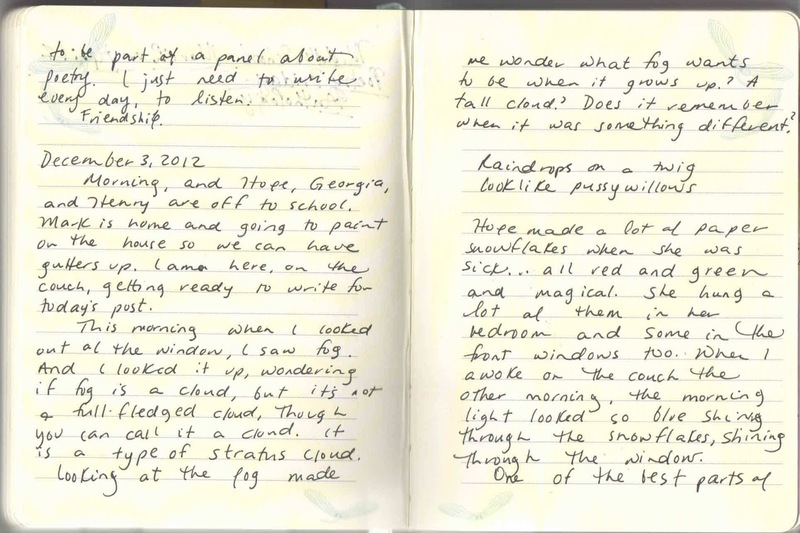 I am so happy to have Mary Lee Hahn as a guest over at Sharing Our Notebooks this week. 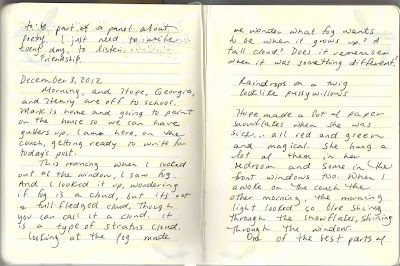 If you have not yet visited her notebook, please don't miss it! And for those of you who knew that I was away for a bit, I am now back to posting on Mondays, Wednesdays, and Fridays. It is good to be home! Thanks for all your tips and links. I like the idea of reading poetry aloud at night to get the rhythm and flow going. Maybe that will help the poeting!!! I am going to share this with my students for sure. 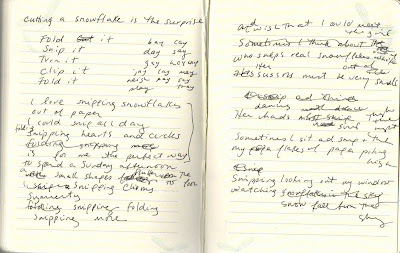 I teach "The Snowflake" usually by mid-October so that when the first magical snowfall starts and all eyes are glued to the windows, I say....."this reminds me of a poem" and they all begin, "The Snowflake" by Walter de la Mare, Before I melt, come look at me,...and your poem will be something we can use in conjunction with it! Thank you. 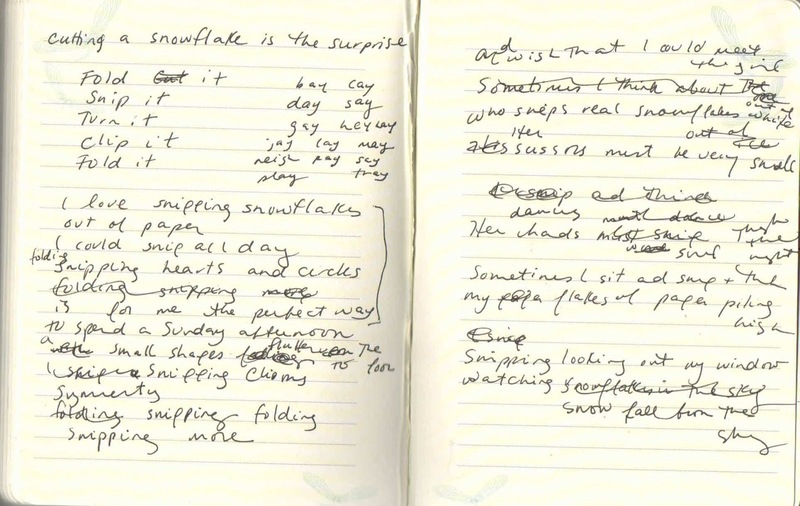 Amy: I love this poem. My 4yo daughter delights in snipping everything she sees (with her many pairs of scissors), so this was especially enjoyable for me to read. Really well done.